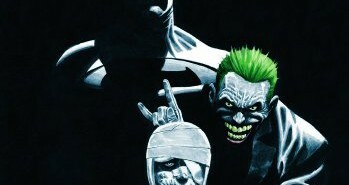 You are at:Home»Posts Tagged "“Arkham City”"
For about half the greenbacks I’d maybe consider it. Da Na Na Na Na Na Na Na RABBITMAN! Back when Toy Biz had the Batman license, I used to joke with my young cousin that the terrible headsculpt made him look more like “Wabbitman.” I never expected we’d get an honest-to-goodness rabbit head on the guy. Batman: Arkham Origins is the most fun I’ve ever had with a comic book-based videogame. I can’t wait to play it all over again. Here’s a rundown of the latest DC Comics news. Take me back to Arkham City where the grass is green and… set in the Silver Age?! All I want to do is be Harley Quinn and hit Batman in the face with a giant mallet and not pay $60 for the experience. Is that really too much to ask? If someone could make a Kim Basinger as Vicki Vale figure and send it back in time to my 12-year-old self I’d be quite appreciative. New Arkham City figures, and an old paean to how much I love Arkham City’s Penguin.